The Social Ministry team supports local nonprofit organizations that provide food, shelter, health care and services in the community. Additionally, we support important programs that benefit God’s people around the world. These include Compassion International and Operation Christmas Child. 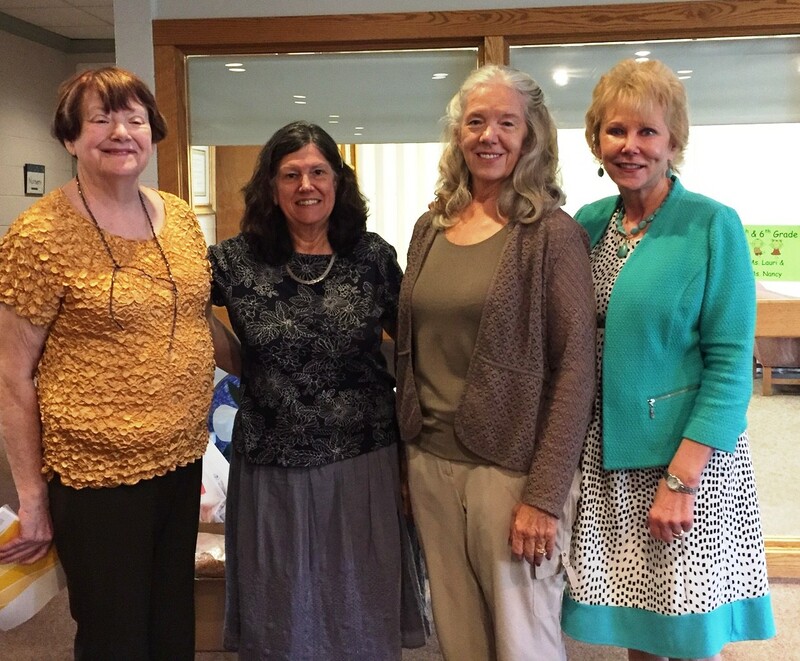 Left to right are four members of the Social Ministry team: Marilyn Ayres,Nicky Cojocari, Carol Feser and Diane DeMarco. Frederick Rescue Mission, Mission of Mercy, Heartly House, Blessings in a backpack and ELCA World Hunger. We also contributed to ELCA’s response to hurricanes, Lutheran Campus Ministries and St. Dysmas Prison Ministry. Other community organizations we support have included: Habitat for Humanity, Second Street & Hope, SHIP and the Community Action Agency’s food bank. The Religious Coalition will complete all background checks of adults 18 years and older, to include parents of youth who wish to participate. Each evening, two – three volunteers welcome families, and offer snacks and water/juice. Volunteers may offer to read to the children, play board games with the families, or otherwise interact with the families as a loving Christian community. The evening hours are 6 – 9:30 p.m. Volunteers can also provide packaged or home-made snacks and beverages. This four-year-old program for homeless families with children provides shelter and supportive compassionate environment and the necessary resources to help participating families regain self-sufficiency. Who are these families? Ordinary moms, dads and kids who for one reason or another have fallen on hard times and need a hand up. Last fall we also participated in ELCA’s “Good Gifts” program, whereby people took ornaments and, instead of a gift, purchased a flock of chicks, a goat, a school uniform for a girl, a mosquito net, etc. to give as a gift to a loved one. More information is at https://community.elca.org/elcagoodgifts. We also collected 86 boxes filled with toys, hygiene items etc. for children around the world. https://www.samaritanspurse.org/what-we-do/operation-christmas-child. In December, we collected gifts for children and moms at Heartly House. Hats and mittens were also collected and will be distributed among the children.